GRAFENWOEHR, Germany ─ One Community Road will be partially closed April 16 to 30 for necessary emergency repairs. Personally owned vehicles and non-tactical vehicles will not be allowed between Gate 4 and Rose Barracks Gate 2 during this time. All POV and NTV traffic should take the off-post route via B299 and St2166. 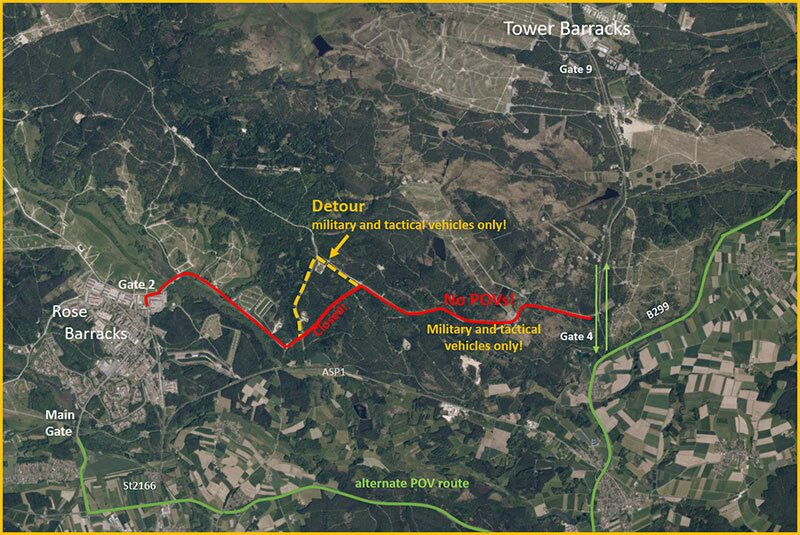 Only tactical and military vehicles, as well as government vehicles with a range pass, will be allowed to use the One Community Road during the closure. This closure will not affect the shuttle buses between Tower and Rose Barracks. Commuters should also allow for more time at the Rose Barracks main gate and Gate 4. Refer to the map for route and closure information.